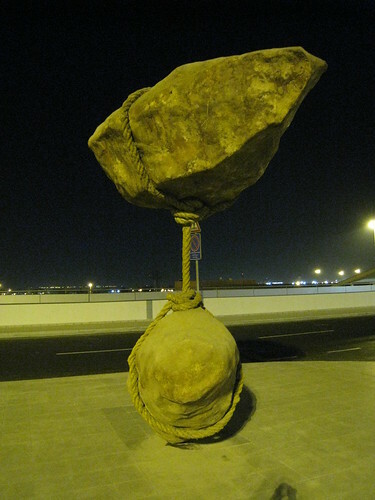 The approach road to recently opened terminal 3 of Cairo International Airport has a strange piece of art in which two stones appear to be defying gravity and trying to rise up in the air by levitation. I have not been able to find more details about the artist but the structure sure looks strange and is perhaps trying to convey that ancient Egyptians may have found the technique of levitation to move/raise huge stones for building their enormous statues/pyramids. Credits: I am thankful to Dr. Faiz for informing me about these strange levitating stones - thank you Faiz. It's really amazing... How is it possible...? Could anyone tell me the way it was made please...? Can't you see its just a fiber glass structure art. How can people believe such things astonishes me.